Set atop a bluff at Lake of the Ozarks, the view goes for miles! Magnificent home with breathtaking views. Enjoy waking up to the unobstructed stunning view of the lake from the master bedroom with wall-to-wall windows or appreciate the panoramic view for miles, including Margaritaville, from the spacious deck. Relax watching the fountains and lights in the private pool. This paradise estate boasts 4 bedrooms and 2.5 baths. At 3700 sq. 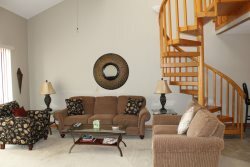 ft., this home comfortably sleeps 10 and is perfect for large family gatherings. Settled on a bluff, this beautifully appointed rental offers large open living spaces, inside and out, for gathering and entertaining. Ample parking is available for additional vehicles. Everything from boating to dining, arcades to golf can be found within minutes of the house! This house comes with a private pool that you can view the lake from! Not that you would want to leave, but if you are ready to get out of the house you are just minutes from the Outlet Mall, Spa's, Mini Golf, Old time photo's...the list goes on and on! Boat and slip rentals available nearby!